With harsh winters, humid summers and many homes built before it was mandatory to insulate, Northern Illinois is the perfect place for home improvements. Also, the Chicago area has access to tremendous government funding for making homes more energy efficient, as part of a regional Energy Efficiency and Conservation Block Grant (EECBG) Program, funded by the American Recovery and Reinvestment Act. 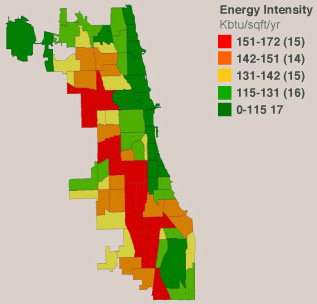 The energy use intensity of a single family home in the Chicago region varies between 50 and 200 (kbtu/sqft/yr). Many factors influence the total energy use (electricity and natural gas), such as weather, age, condition of the structure and amount of objects inside the home. While the average home energy budget is spent 2/3 on gas and 1/3 on electric, actual energy use is 85% gas and 15% electric. Even though it is easier to save on electricity through behavior changes like turning off lights, there is much more potential for saving in gas by following our recommended home improvements. The average homeowner spends $850 on heating during the winter. A home loses 30% of its heating energy due to poor sealing and insulation. Simple fixes like installing door weather-stripping and a doorsweep can save $10 a year on energy costs.